Now that you have created your calendar you want to create activities to put on it. 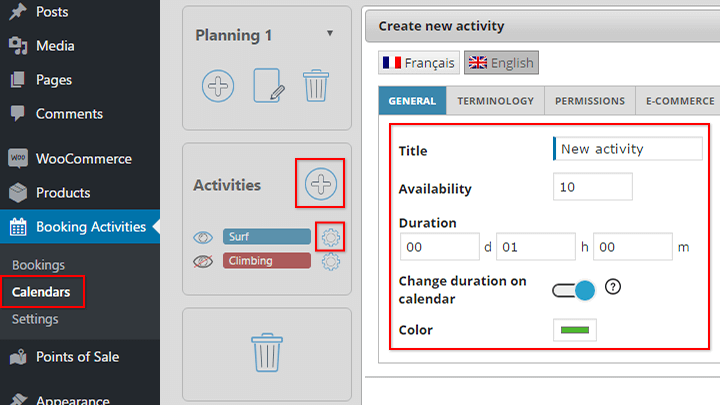 Now you can drag the new activity and drop it wherever you want on the calendar to create an event. This is our next step in this tutorial. Click on the show / hide icon to display or hide events of that activity. Click on the wheel next to it to change its settings like its name and its unit name. You will also be able to choose who can see and edit this activity thanks to Booking Activities’ privilege management system. If you want to use an activity you already created on another calendar, you shall not create a new activity for the new calendar. You shall share the existing activity over both calendar. Finally, there is a lot of availability options that let you make your events private, to restrict the booking quantity, or make the activity available only for certain user roles… Everything is described in this blog post.